Maddie challenged me today. Not that that is really anything new, but she made me slow down and think. As we were driving home from my Mom's, she asked if we could go for a walk in the rain to stomp in puddles. 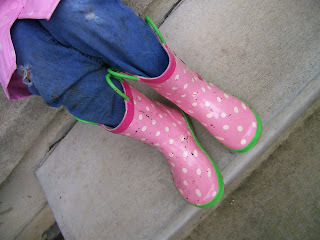 She made it clear that she would wear the boots and get all wet, not me. My first reaction showed that I was too busy. I thought - too busy for what? Why miss the chance to walk around the block with my little one? I would not be sorry. The older kids could take care of themselves. She dressed for the occasion in the cutest coat and boots. She giggled. I smiled. We held hands and scoped the street and sidewalk for puddles deep enough to make a splash. We arrived home a little wetter, but I was doing laundry anyway. Thank you Maddie for challenging me.